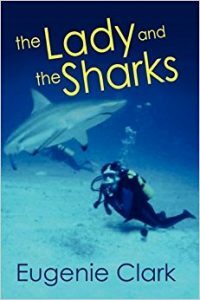 Shark Heroes IV: Dr. Eugenie Clark - We Love Sharks! Shark Heroes IV: Dr. Eugenie Clark - We Love Sharks! Dr. Eugenie Clark or the ‘Shark Lady’ was a scientific pioneer known worldwide for her tireless work with sharks and other large fish. Eugenie Clark (May 4, 1922 – February 25, 2015) also popularly known as The Shark Lady, was an American scientific pioneer and ichthyologist. She is still remembered to date for her ground-breaking research on shark behavior and her tireless efforts to educate people about the true nature of these creatures and other large fish species. Her research helped to dispel many of the negative and harmful myths about sharks. Dr. Clark was a renown authority on marine biology and also a pioneer in scuba diving for research purposes. She used the resulting fame from her research and over 175 scientific publications to promote marine conservation. Eugenie Clark was born on May 4, 1922 in New York City and raised there too. Sadly, her dad died when she was less than 2 years old. Thereafter her mother, Yumico Motomi, married Masatomo Nobu, a Japanese restaurant owner. Eugenie could swim before she was 2 years old and she was already passionate about marine science and biology by the time she was in school. Eugene Clark credits this passion to her first visit to the New York Aquarium at Battery Park. After that visit, she would return to the aquarium on Saturdays every week just to watch the marine animals. She also credits naturalist William Beebe, and her part-Japanese heritage for her inspiration to become an oceanographer. Clark attended grade school in Long Island, and later graduated from Bryant High School in Queens, New York. Moving on to college, she chose to study ichthyology (the study of fish), and paid her way through Hunter College by working on the side. Eugene Clark’s graduate research was in the South Pacific, after which she got a job at the Scripps Institution of Oceanography (San Diego, California). She learnt how to scuba dive at Scripps; a skill that proved invaluable to her later research expeditions. 1) Scripps Institutution of Oceanography in La Jolla, San Diego. 2) The American Museum of Natural History in New York. 3) Woods Hole Marine Biological Laboratory in Massachusetts. 4) Lerner Marine Laboratory in Bimini, the Bahamas. 5) Guam, the Marshall Islands, the Palau islands, the Northern Mariana Islands, and the Caroline Islands under a Office of Naval Research program in 1949. 6) A Fulbright Scholarship for ichthyological studies at the Marine Biological Station in Hurghada, Egypt. Her experiences in Egypt are the subject of her first book “Lady with a Spear” in 1953. 7) The book “Lady with a Spear” caught the attention of Anne and William H. Vanderbilt. The couple invited Dr. Clark to speak at a public school in Englewood, Florida, in 1954. After that visit, the Vanderbilts built a laboratory for her to continue her research. Thus, the Cape Haze Marine Laboratory came to being in 1955. Eugenie Clark taught several researchers and thousands of students during the course of her career. During her time at Cape Haze, Dr. Clark conducted a number of fact-finding experiments on sharks and other fish. As a result of this, the laboratory’s activities gradually began to appear in numerous scientific journals, and requests started to pour in from several researchers. In addition, many researchers came from all over the world to study in Cape Haze. The laboratory later moved to Siesta Key, also in Florida. Eugenie Clark left the Cape Haze Laboratory for a faculty position at the City University of New York in 1966. Two years later, she joined the University of Maryland, College Park, as an instructor. While she was at the University of Maryland, Dr. Clark received several awards of recognition. These included 3 fellowships, 5 scholarships, and 6 medals. She retired from her Maryland position in 1999 and returned to Cape Haze Laboratory in 2000. By that time, the lab was called the Mote Marine Laboratory. She remained there as Senior Scientist, Director Emerita, and Trustee until she died from lung cancer on February 25, 2015 some months to her next birthday. Eugene Clark remained an active researcher and diver even at an advanced age. Her last dive was in 2014 at the age of 92. The results of that dive were made public in January 2015 with more research still under review at the time of her death. Eugenie Clark goes down in history for at least 175 scientific publications, 2 books and many articles. She wrote two books, Lady with a Spear (1953) and The Lady and the Sharks (1969). The information gathered from her work helped to dispel harmful assumptions about shark behavior and intelligence. Consequently, her efforts helped reduce the senseless killing of sharks and also encouraged the preservation of marine environments. For instance, records indicate that she was the first person who trained sharks to press targets. Clark also discovered that the Moses sole produces a natural shark repellent. Since then, this secretion been used by researchers looking to prevent harmful human-shark interactions. She helped to prove that not all sharks need to keep moving in order to breathe. She worked on 24 television specials and helped with the creation of the first IMAX film. 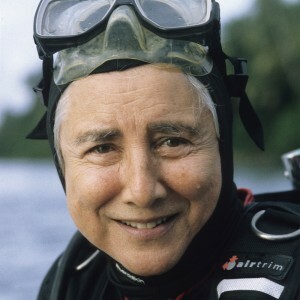 During her decades of research, Dr. Eugenie Clark conducted more than 70 submersible dives, and she led at least 200 field research expeditions worldwide. 3 honorary D.Sc. degrees from the University of Massachusetts, Long Island University, and the University of Guelph. Recipient of the 1987 Award in the Science category of a NOGI, by the Academy of Underwater Arts and Sciences. Actually, this is considered as the oldest and most prestigious award in the diving world. Induction into the Florida Women’s Hall of Fame. Induction into the Maryland Women’s Hall of Fame. Accolades from the National Geographic Society, the Explorers Club, the Underwater Society of America, the American Littoral Society, the Women Divers Hall of Fame, and the American Society of Oceanographers. A 1996 Emmy Award for her underwater films. Dr. Clark received many more awards and medals all of which you can see on the Mote Marine Laboratory website. Species of fish named in her honor. The U.S. Congress recognized her posthumously for her work on March 16, 2015. Dr. Clark’s work will remain relevant in the scientific community for generations to come.